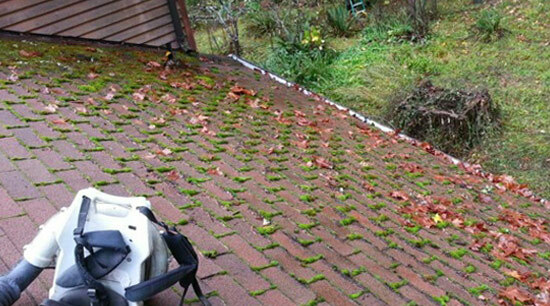 We’ve all seen it before; as the rainy Oregon season (October-April) comes and goes, your roof probably starts “growing” that pesky green stuff… Roof Moss. To most of us, roof moss is just a cosmetic annoyance that makes our roofs look bad. The truth, however, is much different. Leaving moss in place can, and will, cause damage to your roof and home over time. Moss is a plant that thrives in the Northwest. It loves moisture and damp, shaded places. If your roof is partially shaded, you’ll notice that far more moss grows there as opposed to direct-sunlight. In the Spring and Summer, when the Sun & heat arrive, moss tends to go away or become dormant; turning a brown/red color, and is easier to deal with. The problem is that the Northwest rainy season is so long and so intense that moss has months to fester, grow, and become a problem. Roof moss is a serious problem in Oregon. Once moss takes hold on your roof it acts like a kitchen sponge, soaking up a lot of moisture and rainwater all around it. As the moss grows it entrenches itself between and under your shingles. This is where things become damaging to your roof. That water-soaked roof moss makes it way under and between the shingles, eventually soaking the roof’s underlayment (generally a layer of black paper that separates the shingles from the roof’s wood). Eventually, that will leak through and saturate the roof’s wood paneling. Moisture is wood’s worst enemy. Wet wood will eventually turn into a range of problems, including mold, decay, and ultimately loss of structural integrity. Make no mistake; moss is much more than a cosmetic nuisance. That’s why it’s so vitally important to take care of moss when it appears. The investment in cleaning your roof is likely to be a fraction of the cost of repairing your roof or structure below it. Call Mark Hoge, owner of Cascade Roof Care, at: 541-343-8838, or fill out the form below for a free no-obligation estimate!